On this day a hundred years ago France was going to war. The German invasion of France had begun as part of the Schlieffen Plan and France would soon declare war on Germany. Mobilisation notices went up all over France recalling Reservists and Territorials to the Army and within two weeks more than 2.8 million French soldiers had been mobilised into the army. Also on this day the first clashes between the French and Germans occurred in Eastern France when the 44th Regiment of Infantry encountered German cavalry and Corporal Jules-André Peugeot was killed; the first French Poilu to die in the war. 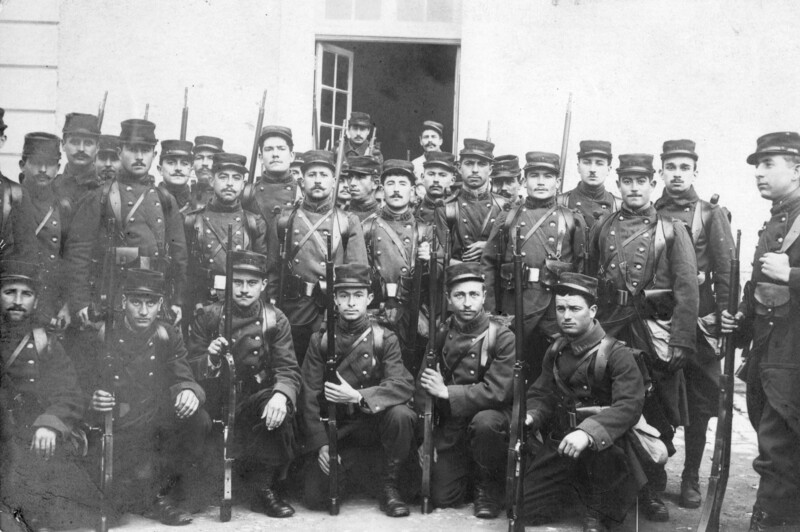 This photograph dated August 1914 shows men of the 113th Regiment of Infantry preparing for war. From Blois in the Loire, they were action a few weeks later and in their first battle suffered more than 1,200 casualties; typical of the huge French losses of this period. This entry was posted on 02/08/2014 by sommecourt. It was filed under 1914, 2014-2018, France, French Army, French Front, Great War, GreatWar100, Poilu, Western Front, WW1, WW1 Centenary and was tagged with 1914, France, French Army, French Front, Great War, Mobilisation, Poilu, Western Front, WW1. Thanks for that my friend – will correct that. Merci Michael – will make some changes.